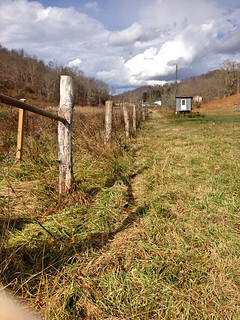 One of the many activities around the farm during the fall season is building and mending fence. 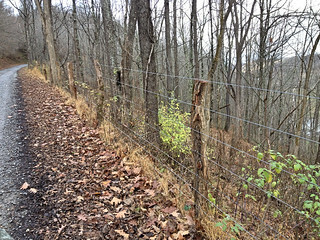 We have several styles of fence around the farm, woven wire, high tensile single strand, and board panels to name a few. If you have fences or plan on building fences on your property it is well worth the effort to cut your own posts and install the fence yourself. 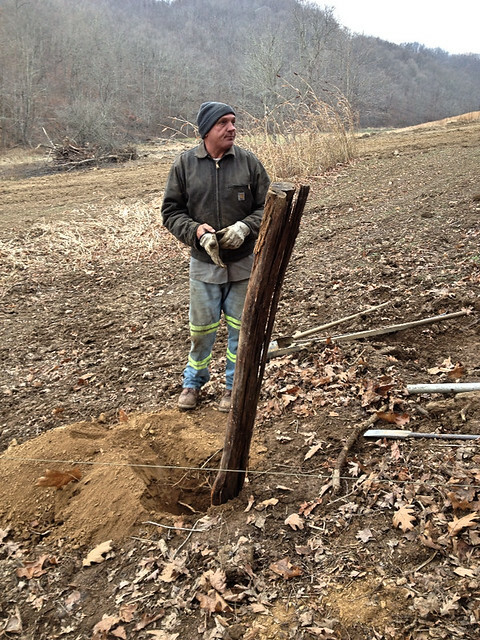 Contracting a fence builder can be expensive! This past year we built traditional fence and had some fence installed professionally. 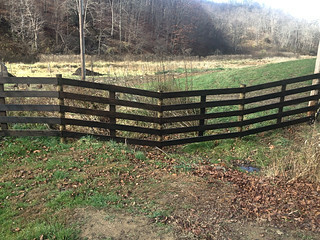 The contracted fence wound up costing $5.00/ft. or more and when we do the work ourselves it costs $0.65/ft. That is a huge cash savings! However, it is a large investment in sweat equity! 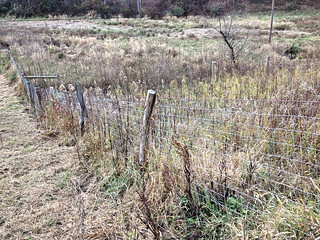 Most of the fence posts around the farm are locust or hedge (osage orange) that we have cut and split from the property. 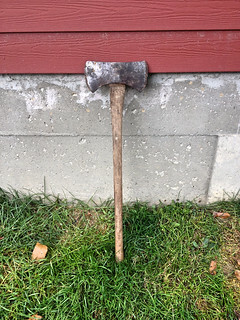 If you’re going to be building fence around your property you will need a few tools. 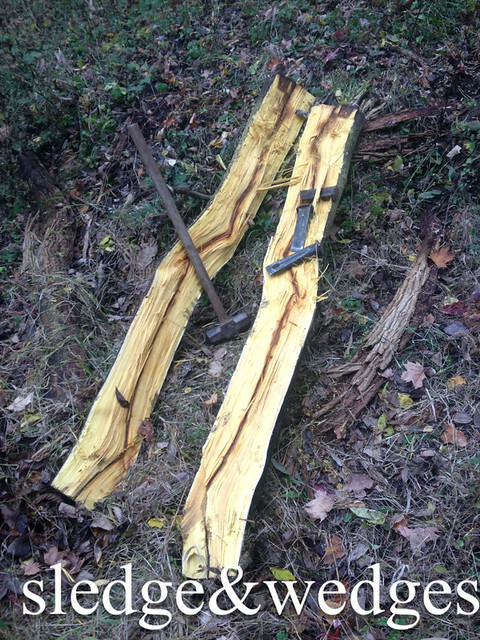 The first tool you’ll need is a chainsaw to fell and limb the trees that will be cut into 7′ fence posts. 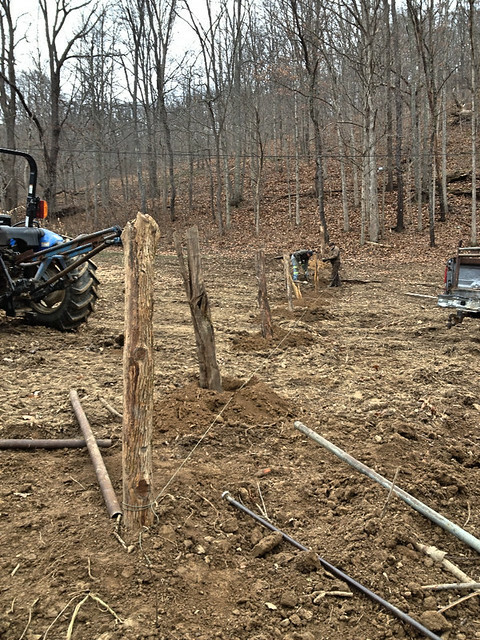 Next you’ll need a sledge & wedges and an ax for splitting the larger posts into smaller posts. You will want to save some of the larger posts for use as corner and gate posts. Once the post are split it’s time to start building fence. 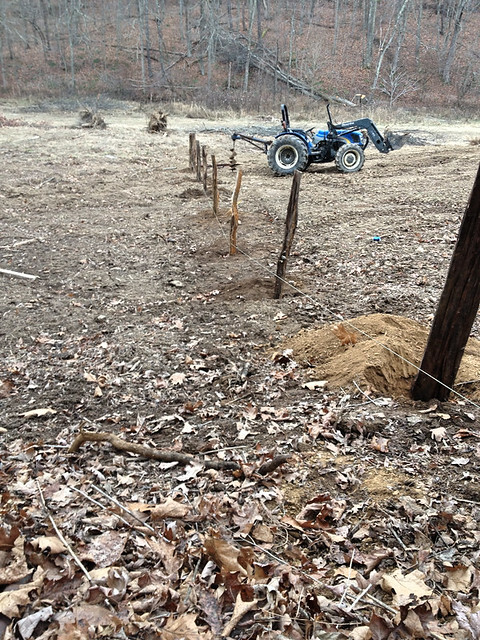 We set the first corner post and run a string near the ground, 550 cord works great for this, to the next corner post. If the fence is longer than your string just set a post at the end of your string. 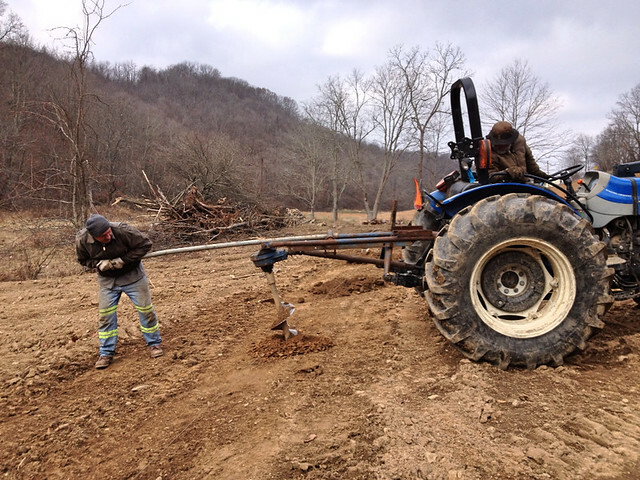 Along the string we mark a spot on the ground every 10′ where we will dig each post hole. Digging post holes manually can be quite a chore. If you have a tractor with an auger the job is much easier. If you don’t own a tractor you could use a 2 man power auger which could be rented at most equipment rental stores and possibly Home Depot or Lowes. 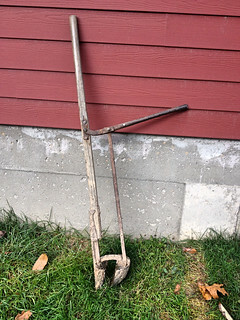 If you have no powered auger option then your left digging post holes with a shovel, digging bar, and a post hole digger. When I was growing up on the farm, my brother and I built many miles of fence this way. 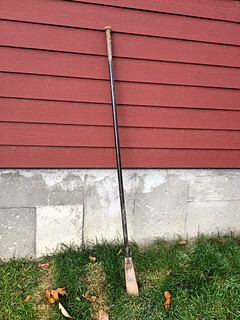 Even if you use an auger, it’s still a good idea to have these tools on hand to clean out and level the bottom of the post holes. 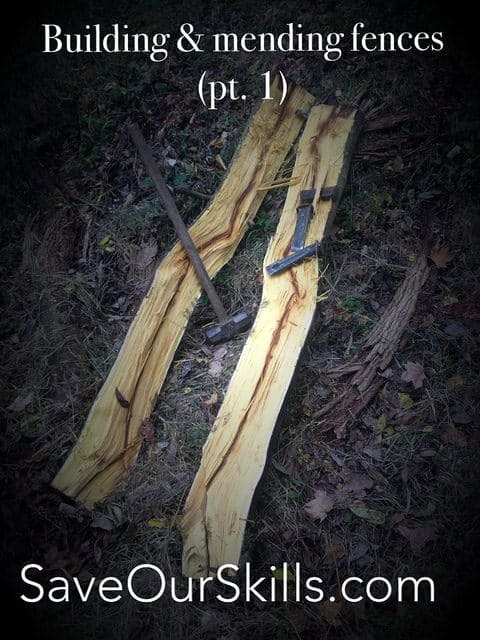 Now you can start setting the posts you have worked so hard to cut and split. Move the string to the top of the end posts and align the top of the post you are setting with the string. When you have the post aligned start filling the hole with a shovel and tamping evenly around the post as you go. Continue in this fashion until all posts are set. You are well on your way to finishing the fence! In future posts I will be discussing corner braces, gates, water crossings, stretching & stapling wire, and much more on building and repairing fences. Also, tune into the Save Our Skills YouTube channel for future videos on this subject.